Life at a South Yorkshire coalmine as it prepares for a royal visit and copes with the aftermath of a pit accident. Ken Loach called The Price of Coal - two Play for Today s (BBC, 1970-84) using the same characters - "a way of describing a mining community with two separate stories". Filmed around the disused Thorpe Hesley pit in South Yorkshire, the project reunited the Kes (1969) team of Loach , Tony Garnett and writer Barry Hines . The plays are drawn partly from experience: Hines briefly, like his father and grandfather (killed in a roof fall), worked as a miner. A Royal visit to a colliery produces much comedy in 'Meet the People' , including urgent cosmetic improvements, the Bomb Squad inspecting a jam sandwich and the Prince of Wales' helicopter blowing off a character's toupee. But serious issues are also raised by the neglect of repairs and in the class-conscious miners' banter about Royal needs. Sid's criticism of inherited wealth involves juxtapositions developed in Hines and Loach 's The Gamekeeper (ITV, tx. 16/12/1980), adapting Hines ' 1975 novel. The second play, 'Back to Reality' , was added to balance the first's fun with a sense of mining's dangers, and gives weight to the camaraderie and managerial negligence, as a fatal underground accident displays the heroism of miners and rescue workers. Claustrophobic underground scenes are testament to Brian Tufano 's photography and the designers' construction of an underground tunnel in a slag heap (filming in the mines was impossible). As he had before, Loach cast club comedians, and was rewarded with naturalistic performances and dialogue. 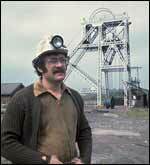 As Radio Times noted, these comics were familiar with mining communities: Bobby Knutt (impressive in a central role), Duggie Brown , Stan Richards and Jackie Shinn (experienced as a pit deputy). Although it's closer to Hines ' own definition of 'entertaining propaganda' than to the overt politics critics expected from Loach, The Price of Coal draws attention to miners' political importance in the 1970s - both plays note that miners brought down the Conservative Heath government. The undermining of such working-class communities would be central to Loach 's and Hines ' subsequent work, separately and together, as on Looks and Smiles (1981). In 'Back to Reality' , Kath Storey predicts that journalists will soon return to condemning miners for "holding the country to ransom", predicting problems faced during the 1984-85 miners strike. The controversy provoked by Loach 's own questioning of news bias and privileging of miners' views in the likes of Which Side Are You On? (Channel 4, tx. 9/1/1985) demonstrated just such a shift in television's political climate.